The Bold and the Beautiful fans love Steffy. She’s someone who makes it impossible not to love her. She might be a bit of a mess in general, but she’s a good mess. She’s got a lot to offer, she’s got a lot to handle, and she’s got a lot going on in her life. She’s a woman who might not always make great choices, but she’s been great about making better choices in the past few years. She’s had a very long road – a lot of that her own doing – and we want to go over a few important things about her that you might not know or remember from her beginnings. She’s a wonderful character, and we all want to know more about her. Steffy was born a twin, but that is one thing many people tend to forget. Her twin was Phoebe, who was her identical twin for many years. And then when they were rapidly aged and they recast another actress as Steffy, writers decided they were fraternal twins rather than identical twins. Either way, her sister was killed when they were adults. She was dating Rick Forrester at the time, and he accidentally drove his car off the road and Phoebe was killed. And then Steffy was destroyed, so she did all she could to fix this problem by sleeping with her sister’s boyfriend and basically living her life for a while thinking that she was doing something for her sister. After all, why not spend that time with her sister when it was all a mess to begin with? But that didn’t work. If you’re wondering why Steffy and/or her twin sister would date Rick Forrester considering they all have the same last name, we have a good story for you. They are actually related and it’s a little gross. Rick is Brooke’s son and the son of Eric Forrester, who is Steffy’s grandfather. But, he is not her real grandfather. You see, Ridge is not Eric’s biological son. He merely adopted him, so the truth of the matter is that he is not really Steffy’s grandfather. So, Rick is really only Ridge’s adopted brother. But, he is now Steffy’s step-brother and adopted uncle. So, they are family, but there is no blood between them. We have to admit this was not one of our favorite story lines, either. Too much relation went on there for this to make sense to us. He might be married to Hope now, but he was married twice to Steffy. He also fathered two babies with her. She lost their first one on a motorcycle accident, and he never forgave her for that. She didn’t think that she’d have babies after that, but she ended up having one with him, and then she adopted a baby she decided to name after her sister, and she asked Liam if he would be the father-figure to this little girl so that her own daughter could really grow up with her own sister and a shared father. He agreed, completely. But, the point of the matter is that she met Liam when he was with Hope, fell for him, and then that’s when he made the decision to not be able to make a decision. He was engaged to Hope, but she was not spending much time with him while they were planning their wedding. She didn’t want to be intimate with him, she didn’t pay any attention to him, and they didn’t have much going for them other than the wedding. Steffy did spend time with him in that time, and Hope did not like it. He ended up running off and marrying Steffy, and he was married to her two times before he ever actually got to marry Hope. 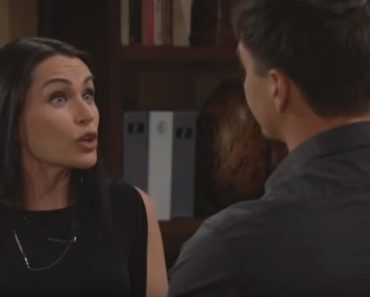 And now she’s trying to get him to go back to Steffy so that he can raise their daughter’s together because she feels that’s more important than him being married to her and not having a baby since she does feel that their baby is dead. She has no idea she’s alive, well, and being raised by Steffy.